Hotel Residence Zust is situated in Verbania-Intra about 1.5 km far away from the town centre (easily reachable by bus from the hotel), offers modern and well furnished 2- and 3-room-apartments (with one or two bathrooms), and hotel rooms. Each apartment has Sat-TV, telephone, safe, kitchen-ware, sheets, blankets, towels, pillows, balcony with lake view, table, outside chairs and sun umbrella. The 2-room-apartments under the roof (without balcony) and the hotel rooms have air cooler. At guests ‘disposal are reception, bar, wi-fi, washing machines, dryers, free park place and garage, lifts, conference room, children playground, table tennis, billiard and playroom. Through an underground passage you can reach a private beach and a heated pool (13.04-22.09.19), both with gratis sun umbrellas and deck-chairs,pool bar (mid June- beginning of September). A new jetty is directly in front of the residence, with boat places and possibility to take part to boat trips to the Market in Luino or to the Borromean Islands. 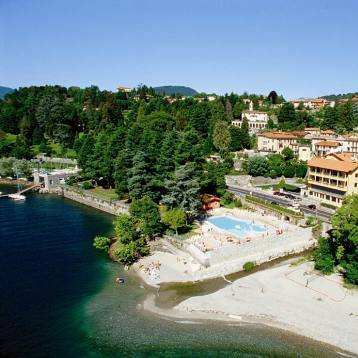 Our guests have the possibility to get free access to Camping Village Isolino and Continental situated in Verbania Fondotoce. In order to have access to the camp-sites, our guests have to wear a daily bracelet. Cancellations are free of charge if done latest 2 days before the arrival date. A later cancellation or a no-show implies the payment of the first night.